I'm a new member and have looked a lot of the tire selection threads, most are how big you can go and relate to aggressive tires. 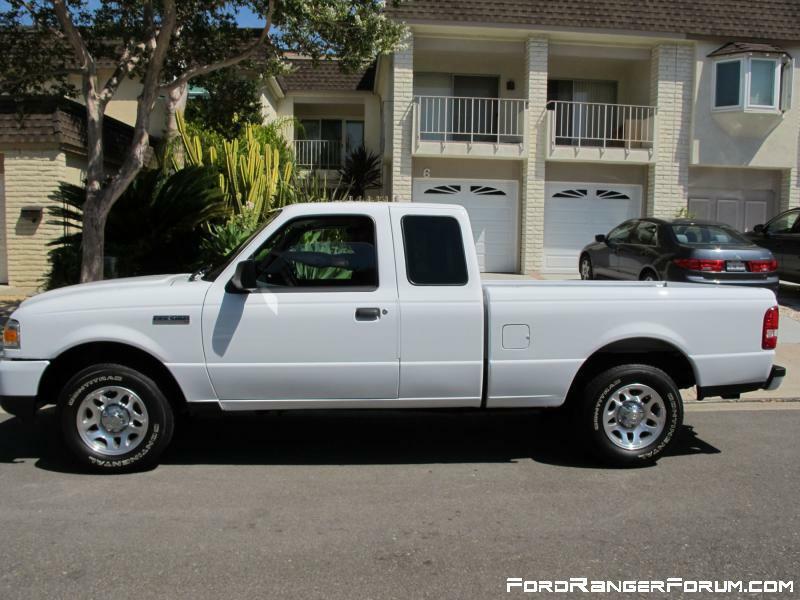 I have a stock 2011 XLT 2WD automatic 2.3L 4 cylinder with 4:10's and the OEM 225/70/R15 Continental ContriTracs. They've lasted well at 54K miles but I'm ready for new tires. I like the idea of going 1 step larger to 235/75/R15 and think they will look, ride and handle better. I was wondering if any of you with the 4 cylinder engine with automatic have done this and noticed notice much decrease in mpg or power? you will hardly notice any difference in power or mpg. the larger size might actually help your highway mpg by bringing down the rpm's since you have 4.10 gearing. can it get any better! I made the little jump up to the 235 no difference I've seen. 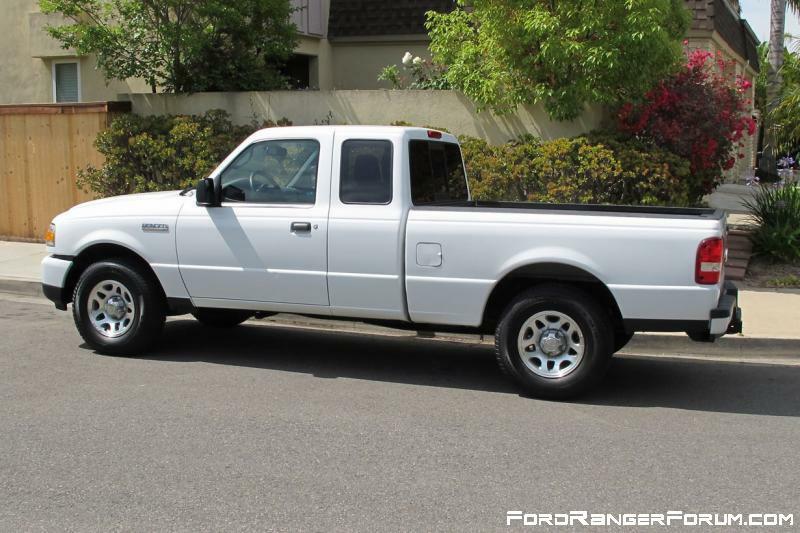 I do have a 5 speed but 4 banger none the less. They look better then 225. Air box mod and throttle cable mod. Tri-fold tonneau cover. VHT taillights. Tinted corner lights. LED driving lights, dome, 3rd breaklight, LED tailgate light bar and LED foot wells. LED tails. I guess I should get the speedometer recalibrated, think that's a computer reset for the 2011's, correct? Probably will have the Ford Dealer do that if the tire company can't. I know I can make a manual correction based on the tire rev's per minute and have done that in the past on other trucks. But I think I'd rather go ahead and have it calibrated. I went up a size from the factory tires, but I have the 16's. No difference but looks better on the truck. Cool Calculator for figuring the difference. 1st things 1st, there's usually a little error tolerance in the speedometer reading. So it's possible that the new tires could make the speedometer more accurate. After you get the new tires, I would try comparing your speedometer readings to a GPS device and one of those radar guns on the side of the street that tell you your speed. If you're going to spend the money on a recalibration, consider maybe forking over the extra bucks for a tuner. It will allow you to adjust your speedometer... along with the MPG/power upgrades. It will run you a few hundred bucks, but if you're ever planing on doing it, now would make sense. Nice find! I don't even think that difference would be noticeable... until maybe 70+ MPH. thanks for the info. I used my gps with the old OEM 225/70/R15 continental contri's that the tread depth was down on from 12/32" to 5/32" and the speedo read 2 mph fast. I put on new 235/75/R15 Michelin LTX MS/2's and the speedo read 2 mph slow. 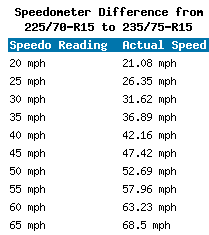 The revs per mile table indicate that the tire change alone would make a 5.5% difference, the speedo reading with the new tires is a 3.4% difference. so until I get a speedo calibration i'll use the 3.4% difference for gas mileage calcs and the 2 mph as a guide when driving. rides much better with the new tires, a little more jouncy up and down and side to side with the taller sidewall. I think part of that might be shocks that have never been replaced. might be, seems like the OEM shocks shouldn't need replacing at 54K miles, are people doing that? I'll ask on the suspension forum too. the put 35 psig in the tires, might try upping that a little too and see what happens. Amazing how putting on a new pair of shoes can change the look so much. Makes u wonder why 225 were stock. And the older rangers had 215? I think. seems like either 205 or 215s on 14"rims lol! Yea looked like training wheels!